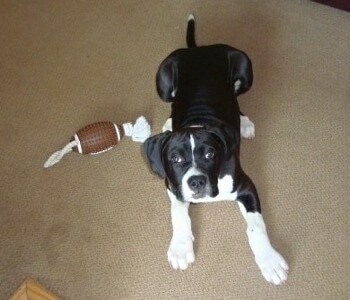 "This is my Boxer / German Shorthair mix (Boxapoint). She is a very active and playful dog. She is 2 1/2 years old now. She likes to play with squeaky toys only. 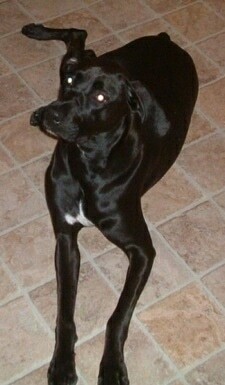 She will also go out in the yard and "point" with her front paw just like a pointer. She likes: kids, balls, cookies (treats), car rides, walks, the lake. Her dislikes: baths!, other dogs jumping on her. She will also wrestle with my husband and get up on her hind legs and "box." She has a mix of both personalities. She has no real big health problems, but she does have seasonal allergies. She is on natural dog food, and we have to give her Benadryl and steroids once in a while. Overall, she is a very good dog, and I would get this mix breed in a heartbeat again. Her name is Charlotte and she was born in Utah. 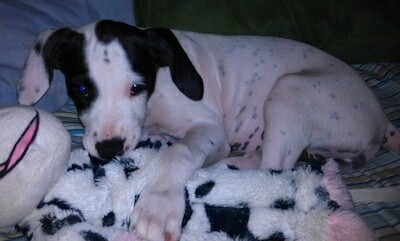 Her mom was the German Shorthair and her dad was the Boxer. The family owned both dogs, and about 15 minutes before they left to go breed the German Shorthair with another, their Boxer got to her." The Boxapoint is not a purebred dog. 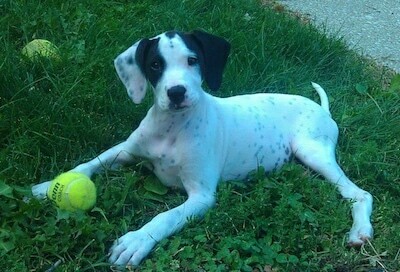 It is a cross between the Boxer and the German Shorthaired Pointer. The best way to determine the temperament of a mixed breed is to look up all breeds in the cross and know you can get any combination of any of the characteristics found in either breed. Not all of these designer hybrid dogs being bred are 50% purebred to 50% purebred. It is very common for breeders to breed multi-generation crosses. 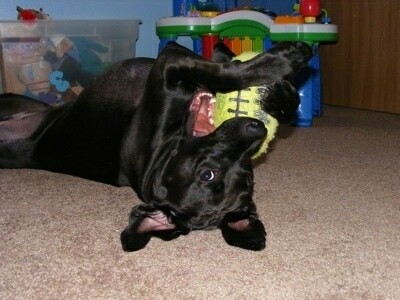 Charlotte, a Boxer / German Shorthaired Pointer hybrid dog (Boxapoint) playing with her toy. 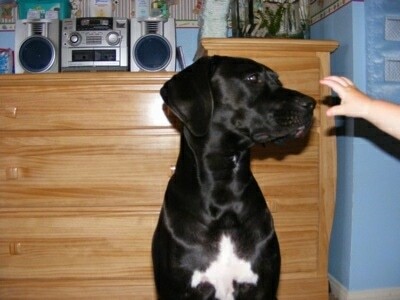 Charlotte, a Boxer / German Shorthaired Pointer hybrid dog (Boxapoint) about to get pet on the nose. 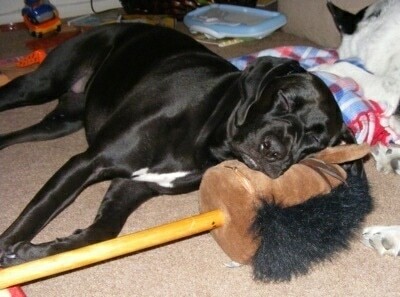 Charlotte, a Boxer / German Shorthaired Pointer hybrid dog (Boxapoint) sleeping on the baby's toy. 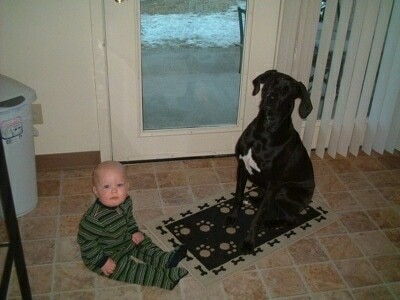 Charlotte, a Boxer / German Shorthaired Pointer hybrid dog (Boxapoint) with the baby. 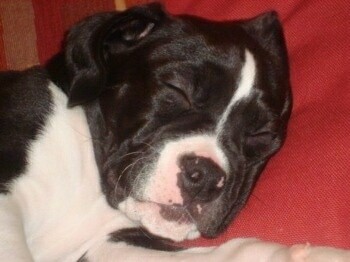 "Roxy is a very sweet Boxapoint. She is 3 months old in this picture. 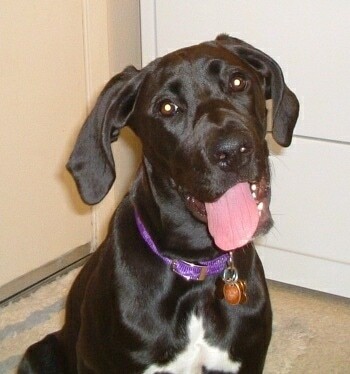 She enjoys meeting new people and is great with kids, but she has a habit of jumping up on them as they enter the house. She loves her squeaky toys, playing fetch in the yard, and being around calm dogs. She dislikes other dogs that try to jump on her and lick her. She is, for the most part, house broken but she will have an occasional accident. She has a daily one-mile walk, and after that she's always ready for a nice, long nap." 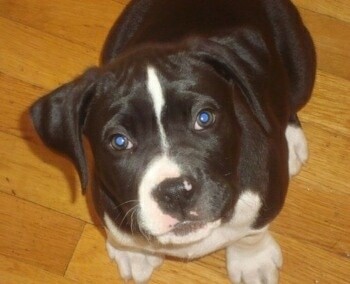 Butkus the Boxapoint hybrid as a puppy—"This is Butkus. We adopted him at a local shelter when he was 8 weeks old. He was born on Valentine's Day. 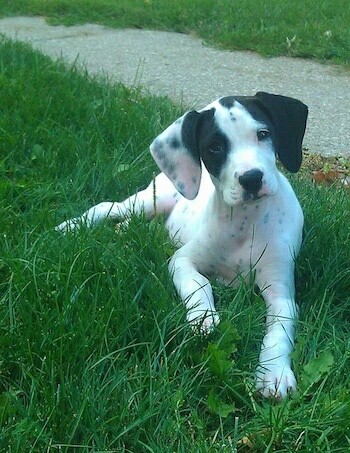 We were told his mom was a purebred Boxer and the father was a Pointer. He was in a litter of 3: him, another male and a female. I picked him from the other two because he was the only one not jumping or nipping. He kind of just sat there looking at me while his brother and sister showered me with licks and nips. I picked him up after and instantly felt a connection and we fell in love with him in only a few seconds. He was 15 lbs., 9 oz. when we took him home at 8 weeks old. Three months later at his 3rd check-up at the vet, he weighed in at 53 lbs." 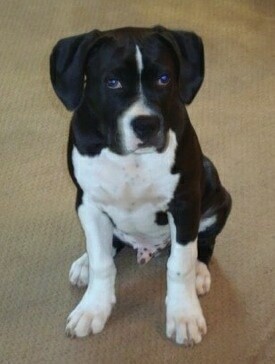 Butkus the Boxapoint hybrid as a puppy—"He is a good dog—loving, caring, loyal BUT still very much a puppy! We're working with him and he's doing well with commands: sit, stay, no bite. We're working on "come" still. He does do well with treats and "leave it" and "take it." He's very energetic and definitely is much calmer when he has a daily walk. However, jumping is definitely a behavior that we need to STOP! He is housetrained and he's learned to walk over to the door and stand there but he doesn't make noise so we watch him when he's inside; if he's at the door, he needs to do "business." We began crate training at 3 months and that has made a big difference. He's in the crate every night. He travels well, loves the car and is good with our kids. We have 2 cats also and he's very curious and playful but not aggressive toward them. We absolutely love him."